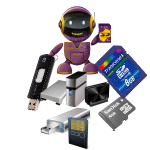 How to format a stubborn memory card, flash, hard drive. If you have a memory card that doesn’t allow you completely format it, there is possibility that it’s either bad or has an error that makes it right protected. However you should be able to solve this problem once you leave this site. I have explained bellow a step by step process to fixing this problem, and you shouldn’t find it difficult to understand. First insert the memory card and try formatting through the normal procedure, by choosing format from the card’s right click. Well you shouldn’t be asking how, since you already have tried formatting the one troubling you presently. If windows does not complete the formatting, quit the process and make sure nothing concerning the card is running. Click start then choose run from start menu. Type “cmd” followed by enters. You should see a black screen, showing a little detail about your computer. Type in the line “cls” to clear text on screen. The last line of the first screen returns. Type “format”, followed by the drive letter in caps, for example. Format H: then press enter to confirm. Don’t format to include the semicolon (:) at the end of the drive’s letter. If you are asked to enter Volume label, type in the name for the memory card. For example. If the name of the memory card is “your name”, then enter “your name” and press enter. You should enter the name exactly as it is in My Computer. DRIVE H: WILL BE LOST! Proceed by typing Y (yes) followed by enter, to confirm. Read and understand the message displayed as your computer verifies and formats the disk. The only thing you might be expected to do at that process is simply to click enter when it ask you to. Some times it might ask, depending on your drives error. You should see a confirmation message when done and you are done as well. The drive is formatted. If it doesn’t work, you might have to update its firmware using software or get a new one. For more information or help click here to contact us.